I recently lambasted poor Pinterest as an awful place for product merchandising. I am back to make amends… kind of. I’m at least back to explain myself. In the first part of this series, I mentioned that Pinterest, Twitter, and many other sites do not make good places for a buy button because they are not primed to convert on their own. Yet these are great sites for product marketing. In fact, Real Simple recently reported seeing more traffic from Pinterest than Facebook, and other brands seem to have been pretty successful with it, too. So why would I say a buy button is a bad idea? And with all the sites out there for consideration (I’m talking about millions of sites), how can a company know the difference between a good site for marketing and a good site for selling? I discussed why there is a difference between point of sale and marketing in the first article of this series. If you haven’t read it, that’s probably a better place to start (find it here). If you did read it and your brain latched onto the discussion of lambs and pressure cookers instead of the key points, here is a very brief summary: Twitter and Pinterest are not good points of sale. Other sites, such as Amazon and Facebook, are great places to sell your products. So, what separates product marketing channels from good points of sale? The answer is in the merchandising. It’s not product marketing, but it’s selling. Etsy is a great site for selling because it is prepared to merchandise: multiple product shots, descriptions of shipping policies, and a bit about the seller are all encouraged. Product marketing drives people to products and thorough merchandising sells the product. It would be a mistake to ask a marketing site to also convert. It would be less of a mistake, but still a bit of a faux pas, to ask your product merchandising to market. Before we go any further, you need to know that this article is about step two: the merchandising. Asking how to represent your products on a site is different from asking whether you should be on a site in the first place. Whether your brand will be more successful on Facebook and Pinterest or whether you should focus your efforts on Newegg and Amazon depends on who your customers are and how they prefer to discover products and purchase them. That’s step one, and it’s a topic for another article (or seven). Here we’re talking about how you treat the sites you decide to focus on. Just because a channel isn’t a traditional ecommerce site doesn’t mean it can’t grow into a fully operational product-selling machine. Facebook is a good example of how products can be sold on a non-e-commerce site, with 34 percent of tablet owners using Facebook stores to purchase products, despite its status as a social media site. As I sat at my desk and mumbled to myself about social media channels and full content and sales, my fellow Pinger Ryan jumped in to try to preserve my sanity. In the process, he put me in touch with his wife, Breia. She and Ryan have a greeting card business called The Brush and Mallett; she markets on Pinterest and sells on handmade-goods shopping community Etsy. I asked her how she thinks content makes a difference on her Etsy product pages. The Etsy community may be slightly to the social side of a traditional e-commerce website, with thousands of vendors posting their handmade goods and connecting with potential customers. The Brush and Mallett is a great example of how even smaller retailers can merchandise on alternative sites, including highly social sites, to get their products into the hands of customers. Etsy is a great site for selling because it is prepared to merchandise: multiple product shots, descriptions of shipping policies, and a bit about the seller are all encouraged. Not all sites provide a good platform for this. Breia has found that the most successful channel for marketing her products is Pinterest. 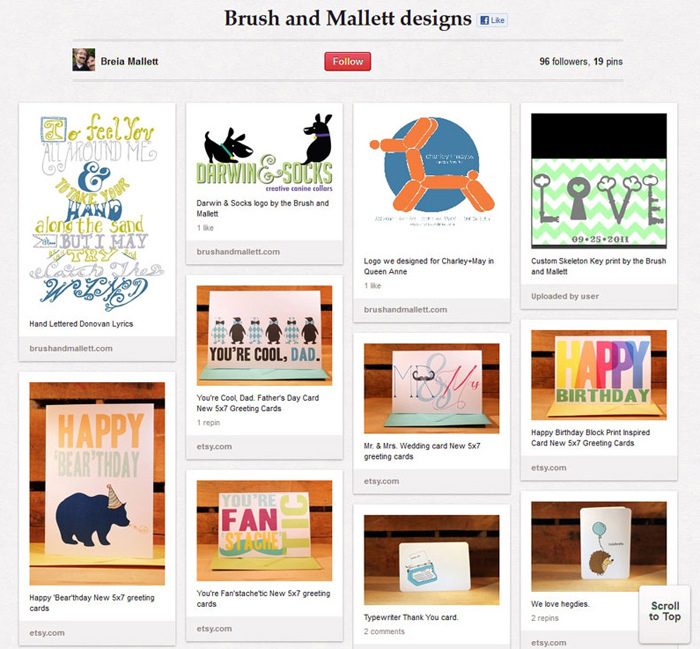 The audience for The Brush and Mallett’s hand-printed greeting cards is active on Pinterest and the site is great at leading potential consumers to the fountain of product knowledge on Etsy. It’s here that everywhere commerce, in which every channel features the option to buy, reveals its drawbacks. A buy button next to each product on Pinterest would be ineffective. It’s not just that consumers don’t know enough about products to be lured into buying on the spot. The power of Pinterest lies in its ability to help people explore new products, recipes, craft ideas, art, and so on. Pinteresters do not want to be bombarded with ugly buy buttons at every turn. It’s the process of discovery that makes the site’s format so appealing–marketing simply gets in the way. And indeed, the site has purportedly already found a way to make money without attempting full e-commerce. Breia disagrees, and I agree with her dissention. For some items, like greeting cards, lengthy merchandising is not incredibly important. Not that it isn’t valuable, but people don’t need to know as much about a greeting card to buy it as they do about a TV. The information necessary for purchasing greeting cards might very well fit into the caption space underneath the photo. As long as consumers know the cards are blank inside, Breia and Ryan’s line of greeting cards might sell well on the site. (In fact, that kind of selling might be downright dangerous for anyone browsing Pinterest–goodbye lunch money). Breia said she would be willing to try it. Hide your credit cards, Pinteresters. I said earlier that the difference between marketing and sales pages is “thorough merchandising.” That’s not very helpful without a little additional information, so here’s a brief review of good merchandising practices. According to Brandbank, “over two-thirds (67 percent) of consumers claim they are put off buying a product online when there is no picture to accompany the product, while almost a third (30 percent) are put off when only one image is displayed for a product when other products have more than one.” One of the keys to a successful product page is multiple, detailed images. At a minimum, show every side of a product to potential consumers. The same research has shown that “61 percent [of consumers] would abandon a sale if there was only a limited amount of product information available.” Comprehensive content is incredibly important for conversion. This holds true even for The Brush and Mallet on Etsy. With front shots, back shots, and envelope shots of each of their cards, Breia and Ryan include as much visual information as possible. They also include thorough descriptions of shipping, how the cards are created, and exactly what will be in the package when the card arrives. Not all sites are meant for selling, and not all sites are meant for marketing. After identifying which sites you are on, figure out which will sell and which will drive consumers to the pages that sell. Merchandise accordingly. Editor’s note: Read our updated article on omnichannel selling and the right place for the Buy button. Are Your Product Pages Ready for the Online Grocery Boom?